It is no accident that amnesty for the criminals who ran the Argentine Dirty War was lifted during Kirchner’s term and that the first human rights abuse trial was successfully concluded on his watch. Today, President Cristina Fernández, Kirchner’s wife and successor, has kept the pressure on and there are hundreds of Dirty War thugs and assassins sitting in jails in Argentina awaiting a fair trial on charges that rival the most heinous crimes ever committed by a government. 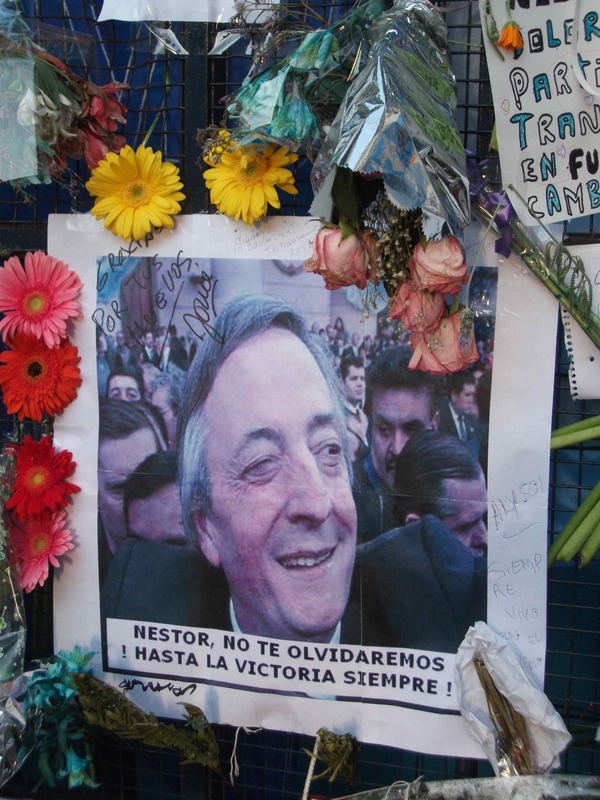 As the posters plastered all over Buenos Aires since Kirchner’s death say: Gracias Nestor. Fuerza Cristina. Nestor was not a defender of the working class, his police shot against strikers, when many workers took over factories, he sent his thugs to evict them. I think neither South American “lefties” governments had/have a chance to stand against American influence in their economy, and this includes Lula’s Brazil. So basically, Nestor was being a Realist, but he had to give some bones to his voters, and taken out some fossiled non-influential generals in today’s casino free-marked economy was one way to do it.